We no longer recommend 888 because of its glitchy and buggy software. The best poker app is US friendly BetOnline Poker Mobile. Play Texas Hold'em cash games on any iOS, Android or Windows Phone. Texas Hold'em Sit & Go and Schedule Tournaments (MTTs) available. Play SNAP fast fold poker games. Get $8 instantly when you download. Also available in New Jersey in the US. 888 (so named as the number '888' in considered to be incredibly lucky in Chinese numerology) are an all-round gambling company formed by Israeli entrepreneurs Avi and Aaron Shaked and Shay and Ron Ben-Yitzhak in May 1997 as Virtual Holdings Limited. 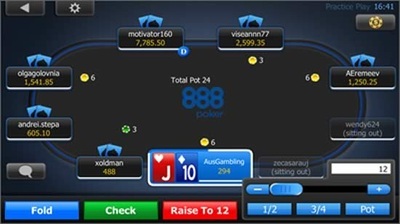 888poker.com was launched in July 2002 and by the end of 2013 had risen to become the second largest online poker brand on the internet, behind PokerStars. 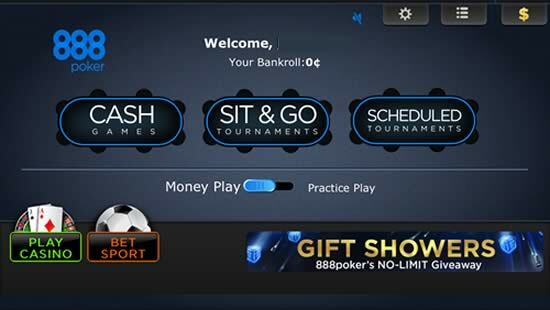 Early in 2012 888poker released the beta version of their mobile app, initially just for Android poker devices. They have now fine-tuned their app over the past three years to make it one of the best mobile poker apps available for smartphones and tablets. This article will explain all you need to know about the app, and how to get it. The apps supports real money and play for fun poker. 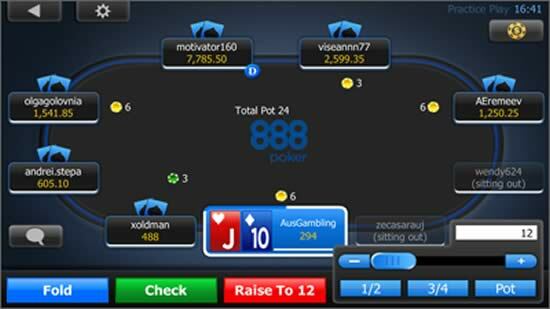 The first thing you are going to need to do to get the app on your mobile or smartphone is to register an account at 888poker, and the easiest way of doing that is via the 888poker desktop site 888. Just fill out all the necessary details on the pop-up screen that appears and you'll soon be all set. iOS Devices: The 888poker mobile poker app is optimised for iPhones and iPads. The app is available at the Apple App Store in a limited number of countries, including the UK, Ireland, Russia, Australia and New Zealand. If the App Store poker app is not available in your country, you can still install the app via the browser of your iOS device by visiting webapp.888poker.com once you've registered. Android Devices: Google Play does not allow real-money gambling apps to be hosted there, so Android users need to download it directly from the 888 poker website. To do this just visit 888 and to start the download of the apk (Android package) file which you can then install. A full list of supported Android devices can be found at the 888's website. Windows Phone Devices: If you own a Nokia Lumia you may still be able to enjoy 888 poker on your phone or tablet. 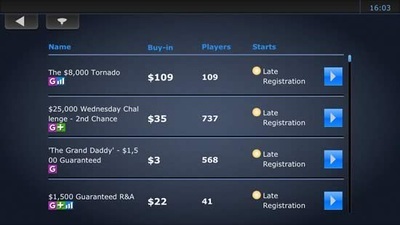 Once you've registered a new player account just visit webapp.888poker.com to play the HTML5 web version. Despite this app being around for over three years now, 888poker still only offers Texas Hold'em cash games and Sit & Go's, even though the promotional blurb on 888poker's mobile page brags of a 'huge selection of popular poker variants' – certainly an odd thing to claim if there are no Omaha, Razz, Stud or Draw games to speak of. 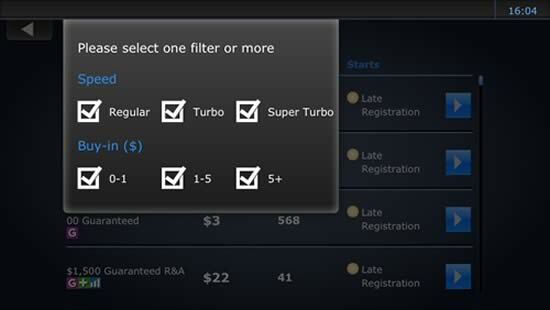 The app has recently added 'SNAP' poker, which is 888's version of fast-fold poker. You can play both cash games and tournament games, and by pressing the 'SNAP fold' button while playing you will be taken away from the table at which you are currently seated and moved to a different one where the next deal is about to commence. The app allows you to switch quickly between real money play and practice play, and you can quickly find a cash/ring game or Sit & Go tournament to your liking. If you can't be bothered to hang around, then just poke the “Quick Seat” button on the lobby selection screen to be automatically seated at an appropriate table. 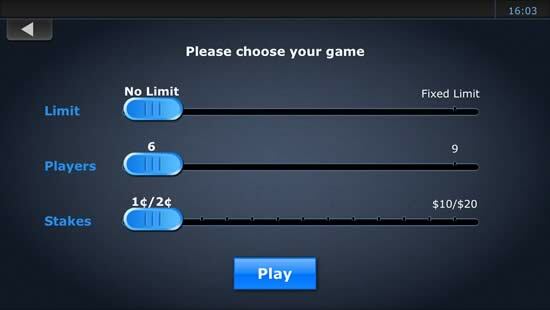 The table view of 888poker's app is extremely easy to use with colour-coded buttons highlighting all the possible play actions. The screen can get a little cluttered on smaller mobiles during nine-handed games, but not so much that it makes play impossible. Play at 888poker is a decent mix of tight and loose players, as you'd expect at a poker room with such high numbers of poker devotees. Android users have the added convenience of being able to bet on sport events via the app, as well as playing poker. There's also a 100 percent welcome bonus at 888poker than could potentially be worth up to $400. Again, this bonus comes with no wagering requirements as such, but the bonus cash is dropped into your account in $10 increments every time you generate 100 bonus points, and you generate bonus points by playing in ring games and tournaments at the site. The more you play, the more cash you earn. All this combined makes the 888poker welcome mat one well-worth treading over! As you'd expect with 888poker being the second most popular poker room on the internet, there is no shortage of funding and withdrawal options. Visa and MasterCard are the two most popular withdrawal methods, although you cannot withdrawal to a MasterCard as per MasterCard's own rules. Plenty of payment options are available as well: PayPal, Neteller, Skrill and a whole host of others. 888 is one of the most complete mobile poker sites, offering ring games, high-speed poker and a variety of Multi-Table and Sit and Go tournaments. The app is also worth downloading to take advantage of those extremely generous new member bonuses. If you've never played online poker before, being able to dip your toe into the poker waters with a no-risk $2 and another $18 in tournament tickets is simply ideal. If you like what you experience, then you can throw some of your own cash into the mix, which 888poker will then double. Sounds perfect! When you sign up for an 888poker account (and we thoroughly recommend that you do) you're joining the second biggest poker party on the planet. That – and those super tasty bonuses – should be enough to convince you that the 888poker mobile poker app is one of the very best.